“On behalf of the City of Mississauga and Members of Council, we wish to acknowledge the hardworking, risk-taking and successful entrepreneurs and small business owners during Small Business Week 2017. “In Mississauga, we mean business when it comes to supporting thought leaders, start-ups and small and medium-sized enterprises to develop concepts, secure capital investments and launch their next big ideas into the marketplace. “We achieve this through the ongoing work of our Economic Development Office and with annual networking opportunities like First Look – Mississauga’s annual and much anticipated angel investor networking event. “In fact, 97% of all Mississauga businesses are small businesses. 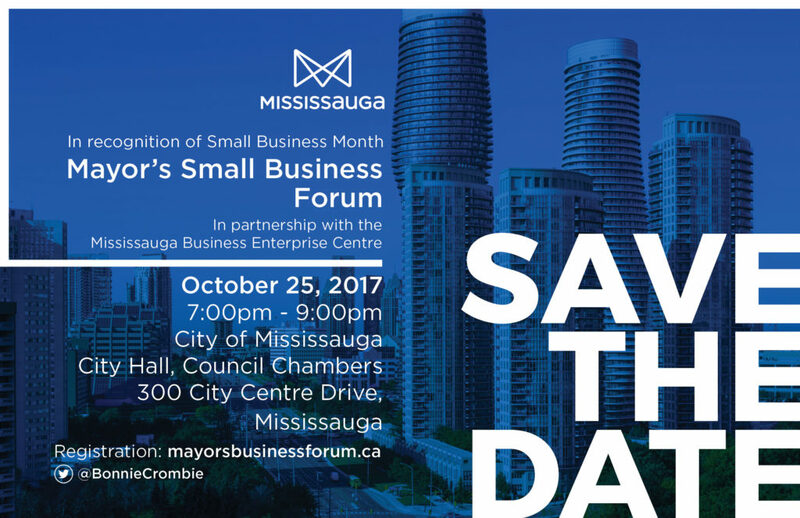 On October 25th, we will host a city-wide Mayor’s Small Business Forum 2017 in partnership with the Mississauga Business Enterprise Centre. All small business owners are invited and encouraged to share their ideas and solutions to help make local government work better for you. “We are excited to highlight that a key component of the event will feature a panel of business and government representatives who will share information about the programs and services available to support our local small business community, followed by a question and answer period. “Participants will have the chance to network and learn about other programs and services provided by some additional local organizations, including the Business Development Centre (BDC) and the Mississauga Central Library. “As part of Small Business Week, I also encourage small business owners to ensure they make workplace mental health a priority by completing the MindsMatter assessment tool. My office has partnered with the Healthy City Stewardship Centre and CivicAction to raise awareness about this online tool and the need to address such an important health issue that continues to impact the lives of so many people. “I have taken CivicAction’s new MindsMatter assessment to see how I can better support mental health in workplaces across Mississauga. I am proud that at the City of Mississauga, we offer a number of important initiatives to safeguard and elevate the mental health and well-being of our professionals. Examples include alternative work arrangements, counselling for employees and families, and healthy food options. This entry was posted in Carousel News, Innovation & Entrepreneurship Taskforce, Mayor's Initiatives, News. Bookmark the permalink.